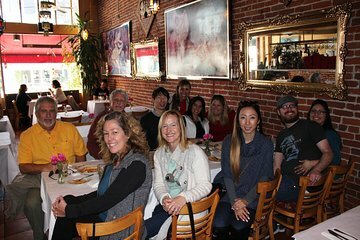 Explore las especialidades gastronómicas de Pasadena en un recorrido a pie de 3.5 horas en grupo pequeño por Old Town, cuya elegante arquitectura Art Deco se encuentra entre las más notables de Los Ángeles. Siga a su guía a través de calles tranquilas y callejones mientras aprende la historia dinámica de esta ciudad en las faldas. Sumérgete en los restaurantes y tiendas de dulces del vecindario que sirven comida de todo el mundo, y prueba el falafel, el aceite de oliva y el helado mientras recorres un circuito de 1.25 millas (2 km) a través del corazón de la histórica Pasadena. We have been on many food tours in different cities and states, and this was by far one of our favorites. Nick was the absolute perfect tour guide - very knowledgeable, friendly, and obviously has a deep passion for Old Town Pasadena. There was not one single food served that we didn’t love - best falafel and mole sauce ever! I highly recommend this tour - ask for Nick - and we can’t wait to go back and explore more. First time we have done a walking tour and thoroughly enjoyed it.Our guide Laura was fantastic and very knowledgeable about the area.We missed the first stop due to public transport problems and Laura brought the sample of food the group had tried when we met at our second stop.Highly recommended. Lots of great information and food! We were full at end of tour. Laura was very knowledgeable and helpful. Barbara was very bubbly and enthusiastic and a great tour guide. I really enjoyed all the tastings. It was interesting to learn about Pasadena, a city I had never visited before. Highly recommend. This tour was amazing! Not only did we have wonderful, varied and plentiful food, but our guide, Barbara, provided an excellent history lesson about Old Pasadena. Our tour lasted 4 hours and far exceeded our expectations. We are looking forward to trying other Small-Group Food Walking tours. prima tour, met leuke gids, die nasst wetenswaardigheden over de plaats ook veel van het eten afweet. Je komt in onverwachte zaakjes, waar ze de heerlijkste gerechten klaarmaken. Steeds kleine hoeveelheden, maar uiteindelijk zit je toch vol. Een echte aanrader, en een leuke afwisseling van het streberige gebied tussen santa monica en hollywood.